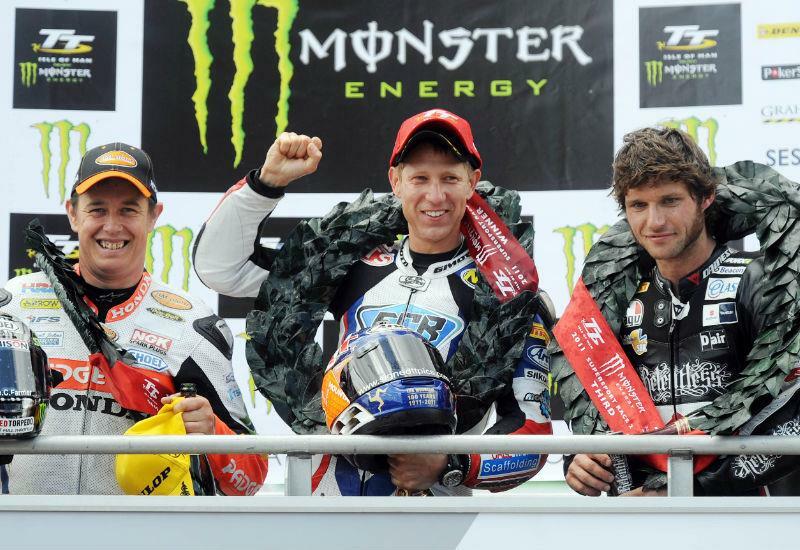 After all the roller coaster of emotions of the week, the rain-delayed Senior ended the 2011 TT on a high note with John McGuinness beating Guy Martin in an epic six-lapper that will go down in history as one of the great TT races. One which fans will talk about for years to come and one, which both riders will probably look back on as one of their greatest performances. For McGuinness it was his relentless drive on the TT Legends Honda from fourth at one stage to first – coming from a average start to win a race in a situation he’s rarely found himself during his TT career. And for Martin, though there was still the horrible nagging frustration of not having yet won a TT, there should be total satisfaction in the way he fought so hard on the Relentless by TAS Suzuki to be the major player in such a wonderful race. McGuinness was the only double winner in a year TT honours were spread around, with Gary Johnson riding a brilliant race to win the second Supersport TT on the East Coast Racing Honda, Michael Dunlop with the satisfaction of finally proving to everyone he can win a big-bike TT with his Superstock victory on the Street Sweep Kawasaki – and Bruce Anstey giving Padgetts of Batley yet another TT win with a great ride in the Supersport TT. There were so many other key players in this year’s TT for me. Keith Amor shrugging off a separated shoulder to finish second in the first Supersport race and score two fourth place and a fifth to finish second overall to McGuinness in the TT points standings. Cameron Donald finally laid to rest any doubts of his speed or his fitness since his 2009 TT accident with a second place in the Superbike race on the Wilson Craig Honda and fourth in the Senior, but spare a thought for the heartbreak of two Supersport race results thwarted by technical issues. Team-mate William Dunlop was also hit by a multitude of technical problems but he scored an inspired fifth in the Superstock race to show he’s fully at home with the TT course now on any bike. And what about Conor Cummins? After that horrific crash in last year’s Senior, the lanky Manxman finished sixth on the McAdoo Kawasaki in the second Supersport race and would have had a rake of top ten finishes had it not been for bike problems. It was a TT of supreme guts and determination and we can all look forward to seeing Conor back to full fitness and at the top of his game in the 2012 TT. James Hillier gets better every year and put in four finishes in the top ten on the Bournemouth Kawasaki – a great prospect for the future. But finally there’s Simon Andrews who deserves a special mention for lapping at 125mph in the final lap of the Senior TT. Andrews applied himself so well to the TT course on the Ice Valley Superstock BMW and is definitely a coup for the TT organisers looking for top names to carry the future of the event. The Senior wasn’t the only highlight of the day. The Yamaha 50th Anniversary parade was a bit special – with Steve Baker’s monster wheelie half way down Glencrutchery road on a screaming TZ750 Yamaha surely etched in everyone’s minds. But it was the TT Milestones of the Mountain parade that really pulled the heartstrings. Seeing the Norton and Honda with Steve Hislop’s name on the fairing screen – and David Jefferies’ on the V&M Yamaha just brought memories of two great TT riders – and two great characters – flooding back. But it was also great to see Phillip McCallen in his original gear riding an original 750 Honda Britain bike, seeing Nick Jefferies back in his original leathers, and Mick Grant riding a gorgeous Heron Suzuki RG500. Giacomo Agostini looked as cool on the MV Agusta as when he raced at the TT. Peter Duke looked particularly iconic astride a gleaming Manx, evoking memories of his dad Geoff who was there, watching from the sidelines. But it was Malcolm Wheeler who won my concours prize for becoming Freddie Frith for the lap – kitting himself out in period gear (pudding basin, black leathers and lace up boots – plus an original-style number bib tied around his waist) and rode a 500 Norton. And then there was John McGuinness in his same 2007 riding gear, on his same 2007 HM Plant Honda that he broke the 130mph barrier on in the TT Centenary and Ian Hutchinson riding one of the Padgett Hondas from last year when he racked up a record breaking five TT wins in a week. What really set the whole thing off was watching all the TT heroes and seeing and hearing all the legendary bikes on Glencrutchery Road while listening to Murray Walker’s iconic voice over Radio TT airwaves, commentating on the event with an enthusiasm and passion for bikes that he’s had all his life. Simply wonderful.